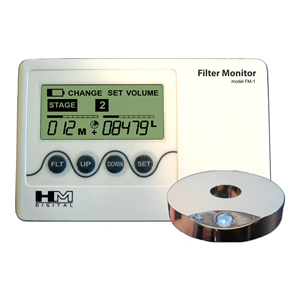 The FM-2 Filter Monitor from HM Digital is an innovative device that will alert you when a filter needs to be changed on your RO/DI water purification system. The FM-2 Filter Monitor uses color-coded lights at the base of the faucet, and has 5 timers for a 5-stage system. This system also comes with water volumizer, and programmable set-points and alarms for each function. A neat auto-shut-off feature, will prolong battery life (2xAA included) as the unit will shut down 5 minutes after the water is turned on. A five-stage filter monitor with five independent timers and a tri-color LED faucet indicator disc. Counts time and volume for up to five stages (can be less). The LED indicator disc will illuminate a green, yellow or red light when the water is turned on. The color indicates the percentage of elapsed time and volume used. Auto-Off function conserves battery power. The unit shuts off automatically after 5 minutes of non-use. The timer counts down in months or days (settings can be modified). The volumizer counts up in gallons or liters (settings can be modified). Includes an audible alarm (beep). Modern design is perfect for any kitchen. Includes the FMS-2 flow sensor.